My goodness I've been lazy recently. None the less I've started trying to make a more websitey site than a blog site. Take a look if you like. There are a few bits and pieces up and a couple more or less new instruments. Note I've had massive computer failure and death in the family, so things have been mostly stopped. Well here we go again. Sam Gossner, the man behind Versillian Studios and the VSCO2 Orchestra, has created the Versilian Community Sample Library. It is really just starting, but there are already lots of fun samples. These samples and my instruments are CC0 which means you can use them for anything you like. I tend to normalize samples and do other things to them, so when the SFZ versions come out from Sam or other clever SFZ devs, they might well be more to your liking. I'll let you know when they are released and where to get them. 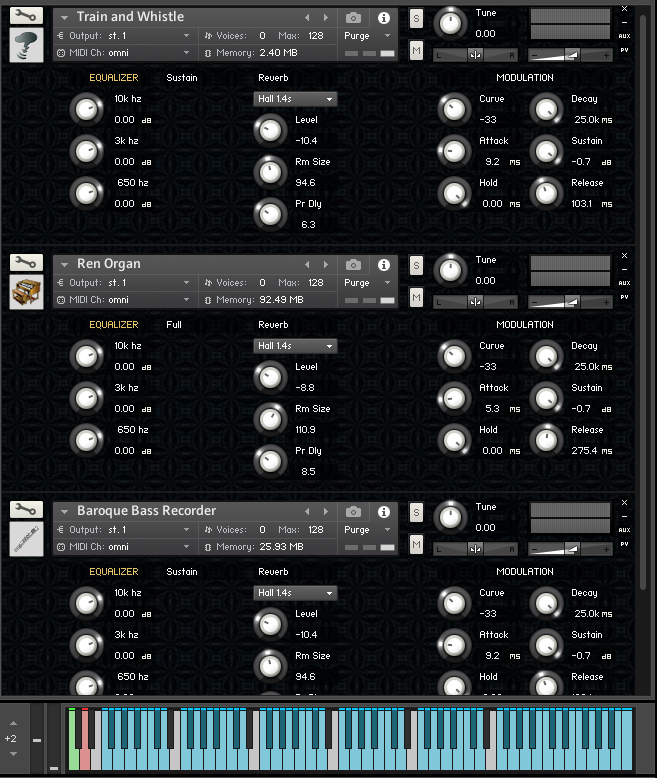 These instruments require a fairly recent version of Kontakt. Thanks to StatKsn from VI-C! Here is a bonus instrument. Mattias Westlund of SSO fame created this violin trio using the violin samples from VSCO2, MSLP, ldk1609 and MIS. The zip also contains the SFZ mappings by Mattias. There is a second included nki that smooths the transition from p to f and adds vibrato thanks to StatKsn from VI-C.
As per usual by downloading these instruments you are agreeing to terms and conditions. Relive the sounds of the 90s with Thrilling 16 bit Mono! 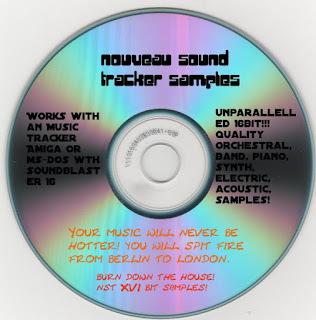 CD after CD of Cutting Edge Samples for your Amiga or MS-Dos computer. Supports Kontakt with thrilling Reverberation, Equalization and Envelope Control technologies! Now in downloadable form to save the cost of postage or anything else! So hot you will need to wear your Asbestos Suit! Legal notice NO CDs are included in this offer. Download CD #1. The sound of 36 Flute Type Instruments. Over 4000 samples. Listen to the World Class Demo from a Midi File found on the Internet Here! Download CD #2. With 21 Acoustic Keyboards this CD this collection will amaze your friends who probably have no more 3 or 4 clavichords or pianos in their entire house. With 6500 samples only cutting edge zip compression technology allowed us to fit this on one internet! Shhh. Don't tell anyone but we made a mistake and left out the samples for #11. Here is #11 and we'll get the original file fixed. Listen to the Winter Games Demo from a midi file found on the interwebs here! Download CD #3. The Beauty of the Human Voice shines through every bit of these 30 Choral Instruments. Over 1000 samples of singing goodness! Lots of happy vowels. Listen to Why We Never Let bigcat Near A Keyboard! Download CD #4. Big, Bad, Bold Brass. 35 Brass instruments and well over 5000 samples. For those of you who love Heavy Metal we have a couple Tubas! Love that joke. Download CD #5. Lots O Strings. 35 instruments and over 6000 samples. Polyphonic NKIs. Use these to turn the strings from mono to polyphonic. Magenta is a Google Brain project that has created something called NSynth, I can apparently use the NSynth Dataset to create instruments. The Conducator has baton swishes, cloth crinkling and ripping, flies buzzing, mumbled naughty words and audiences grumbling and even a gunshot for that authentic concert sound. Created using Public Domain samples from Freesound.org. Thank you Free Sounders! The internet has allowed for collaborations across time and distance. Seven years ago this thread appeared on KVR. Mihai Sorohan and his friends and family had created an ensemble vowel choir. I'd happily downloaded it much later and made myself my own little Kontakt version because that's what I do. Over at Scoring Central (run by the guy who created the Sonatina Orchestra) where I hang out with friends and musically gifted AIs, someone asked about free choirs and mentioned this free ensemble. Somewhere someone mentioned that it was nice but it would be nice if it sounded fuller this reminded me of the Kontakt script J's Ensemble Maker created by Jay Bacal over a decade ago. 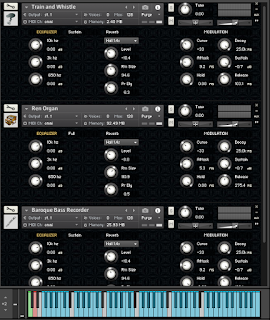 This script can multiply solo instruments by up to seven through Digital Wizardy understood by about a dozen Kontakt scripting pros in the world. So after finding a public domain piece of clipart and using the freeware GIMP graphic editor to fake a woodburned GUI look, out came the Kontakt instrument. But folks on VSR and SC wanted an SFZ version and I don't know how to do that. Fortunately Sam Gossner the headman at Versilian Studios (the guys behind the VSCO2 Orchestra) has created and given away a free folder-to-SFZ converter and made a nice video on how to use it. So after a bit of confusion and renaming 110 files I was ready to send out the SFZ version. I just wished I knew how to make a ketswitched patch for it, but hey you can't have everything right? Then into my inbox comes a full keyswitched version from Pytchblend from KVR. 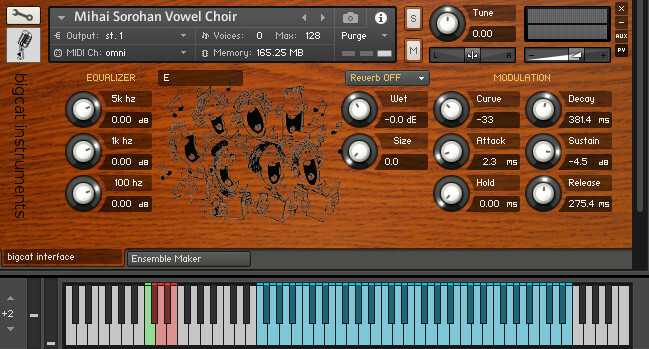 And that is how using freeware, samples and help from friends a free choir is put up on a blog. "The choir patch was developed by Mihai Sorohan together with Richard Osborn for Mu.Lab Multisampla and Selcuk Bor (from Symphony of Specters) for Kontakt. Choir: Citrina - soprano & alto, Jelena - alto,Roman & Dimitri (Timohi) - tenor, Jonny Zed - tenor, Mihai - tenor & baritone"
You may use the sample content as an integral part of your musical composition, in combination with other sounds, for both personal and commercial purpose. I don't accept any responsibility for any damage, loss, liability, injury or upset caused to or suffered by you as a result of misusing this material. " The gang over at Vi-Control have a bizarre thread about a legato piano that started on or around April Fool's Day, VI crashed recently so its tough to say. Being a bit crazy I decided to see what would happen if I used Big Bob's WIPS scripts to create a legato piano with vibrato. It sounds pretty weird. Instrument and Samples: Public Domain.